Who Gets to Be “African”? Local historian provides a different take on the term African American. Being an African American woman, I knew coming to South Africa would be a different experience for me. In my community, Africa is idealized as “The Motherland.” Known to be our home before slavery, it is mythologized as the place where our melanin was birthed along with our pride, where our culture originated, our people were free, and our power was supreme. In other words, it’s where we “really belong.” While these romanticized notions of Africa were in my mind for sure, I wasn’t naive. I know how far removed by time and distance I have been from Africa and its respective cultures. I didn’t expect to “find myself” here. I came to learn about history and about culture, and I planned to grow along the way. Well, my first step of growth started here in Johannesburg during the first week. After spending a week here, I became overwhelmingly aware of my Americanness. In America, my blackness is one of the most dominant aspects of my identity. It’s my source of pride — a direct link to community and identity. However here, blackness has a very different connotation, a different history. A history that, for the first time, I didn’t necessarily share. For the first time I was in a country surrounded by people that technically looked like me, but didn’t necessarily feel like “my people.” These feelings caused me to question how much of my African heritage I can claim. Africa as a continent is beautifully diverse in language, culture, food and heritage. And to generalize my experience in Johannesburg as all of Africa would be to trivialize its diversity. But, because of history, I don’t exactly know what my country/countries of origin are, and I don’t know that if I were to know them and go there, that my experiences would be any different. I didn’t feel a deep sense of connection to the culture, didn’t recognize the languages or foods. Do I even deserve to partake in African culture at all? I began to think. Am I participating in appropriation as I try to appreciate my heritage? In the beginning of the week, I only pondered these things — come Saturday I had to address them head on. 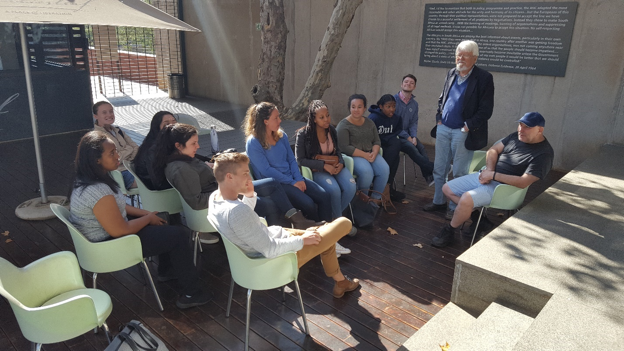 We had the opportunity to speak with a local historian who with insight and poignance, shared his views on the current state of South African politics, activism and the role history plays in both. While those aspects of the conversation were eye-opening and informative, there felt to be an underlying sense of hostility mainly directed at me. He introduced his talk by explaining his frustrations with African Americans and his personal dislike of the term. This comment was wholly unrelated to the rest of his talk. Alarmed by this introduction, I listened intently to the rest of his talk, but made a point to ask him to elaborate on his views at the end. He explained that he believed that African Americans didn’t deserve the “African” prefix of the term for three main reasons. The first being their lack of knowledge about Africa; the second being the way the term generalized the cultural diversity of Africa; and the third being that it was divisive and that, as Americans, we should all simply be American. He then preceded to defend his right to the title “African” because of his history and his family’s history on the continent. While I had been struggling with my own claim of an African heritage and identity, it felt rather jarring for a white man to look me in the face and tell me he had more claim on Africa than I did. We both have ties to the continent, albeit for different reasons; we both deserve the right to claim our relationship with this place. While I completely disagree with his opinion, I was open to it. To live in a world of homogeneity does us all a disservice. I was open to the difference in opinion, especially one I had never heard before. It forced me to not just ponder my relationship with my African heritage, but really take a stance about it. From that conversation, I’ve come to a realization. I do deserve the title African American (I was never really uncertain about that part), and I do have right to claim my African heritage. My title as an African American is meant to be inclusive of not only me but the millions of other Americans who are a result of the African Diaspora and whose ancestors were brought to America because of the slave trade. The harsh reality of slavery has disconnected many from their ancestry, from their countries of origin and the cultures of their ancestors. This term is meant to acknowledge this, connecting people to a diverse set of cultures and a heritage that many have been deprived of knowing much about. Which leads to the second part of my realization — my African heritage. It’s not my fault that I don’t know where my ancestors were from, that their culture wasn’t passed down and that I don’t fully identify with the contemporary climate of Africa’s diverse cultures and communities. African Americans have lived in America so long that they have created an entirely different and unique culture of their own, a rich culture that I cherish and take pride in daily. That is my most immediate connection to culture. But, that doesn’t mean that I can’t feel connected to certain African cultures as well. The gap lies in a lack of education. One point that the local historian made that I had to agree with is that there is an ignorance about Africa and its diverse cultures. Now, I don’t think this justifies taking away someone’s identity, but it’s definitely part of the reason I was struggling earlier in the week. Learning about the different histories, cultures and traditions of Africa is how I intend to take part in my African heritage. It’s a more meaningful interaction with my heritage that expresses a deeper appreciation than just wearing clothes with West African prints or flaunting Adinkra symbols. It’s about more than that. So, I’d like to say thank you to the local historian. Thank you for challenging me, thank you for making me think, and thank you for your opinion, but I think I’ll keep the term African American too. Ashleigh, this post is so powerful because of its content and its beauty. Thank you for sharing these intimate thoughts. Well written and hugely important for others to read! I saw your blog while just mindlessly scrolling through recent posts, and I must say I’m shook. This is definitely an interesting perspective, and I wholly agree with your position. Way to hold on to your culture and identity! Good piece.